Reduce weight and streamline engine compartment. These installation kits are a direct bolt-in replacement for the 79-93 5.0L Mustang (non-modular engines). It eliminates the power rack, pump, pulley and rag joint for a total vehicle weight reduction of more than 30 lbs. Provides smooth responsive vehicle steering. Ideal for drag race and street use. 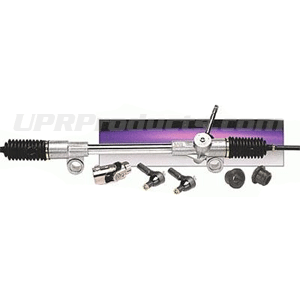 Click Here for Instructions No one else gives you the bold clean styling of our Aftermarket Dress Ups, Suspension and Performance Parts for your American Muscle Car like UPR Products! Fits these Vehicles: 1994 1995 1996 1997 1998 1999 2000 2001 2002 2003 2004 GT V8 Mustang Roush & Saleen Vehicles.